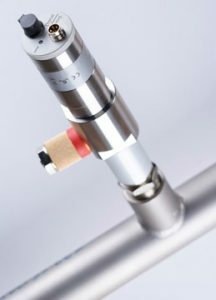 VPInstruments announced its VP dew point sensor featuring a measurement range of -70 to +60⁰C, enabling the measurement of both refrigerant and desiccant type air dryers. This dew point sensor features a robust sensor with a polymer technology that enables it to fully withstand getting wet. It is also highly resistant to particulate contamination, oil vapor and most chemicals. The built-in offset calibration algorithm ensures performance at low dew points. It enables monitoring of both dew point and temperature simultaneously in VPVision and other energy management systems. Communication is via its RS485 (Modbus RTU) output. The sensor also features a 4 to 20 mA output that can be connected in parallel to an external display or other device. An integrated alarm function can make alarms visible in the management software. The alarm is also visible via the LED on the VP Dew Point Sensor itself.